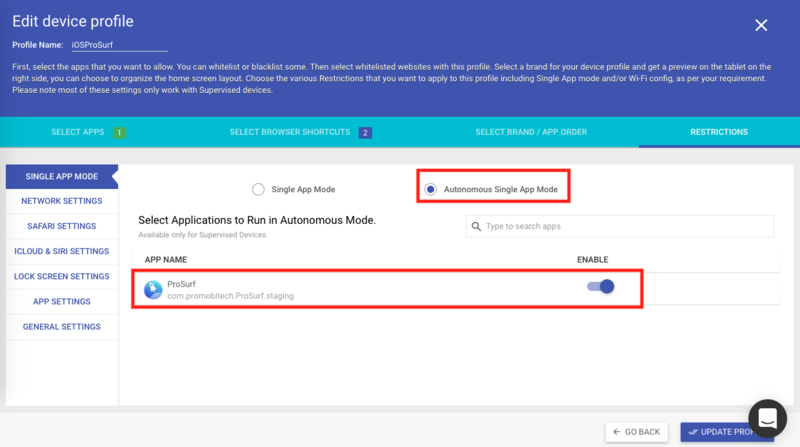 Autonomous Single App mode is a feature of iOS where the applications can enter into Single App mode and exit out of it on demand. This mode is comparatively better than pure Single App mode as if the device is stuck in single app mode, then you would need a Mac machine to remove the device from MDM and then re-enroll the device after fixing the problem. Consider a use-case where you are developing a website for Doctor-Patient interaction, where the Doctor gives their iPhone/iPad to the patient to enter their personal information. However when the Doctors gives the device to the Patient, they does not want the patient to leave the Website and do any other thing with the phone. But once the device is back with the Doctor, s/he should be able to use it normally. This use-case can be handled easily by Autonomous Single App mode. ProSurf Browser gives you the flexibility to invoke functions from your Website so that your website can put the ProSurf application in Single App Mode autonomously. In this guide we will see how to achieve this. Make sure you have ProSurf activated for your account as described here. That is it. Those are the steps required on the Dashboard. When the Website is loaded in ProSurf application, then an object by name ProSurf is injected into your page. You can use the following code snippet in your website to check for availability and invoke the functions as required. What if the Website is not Developed by You? 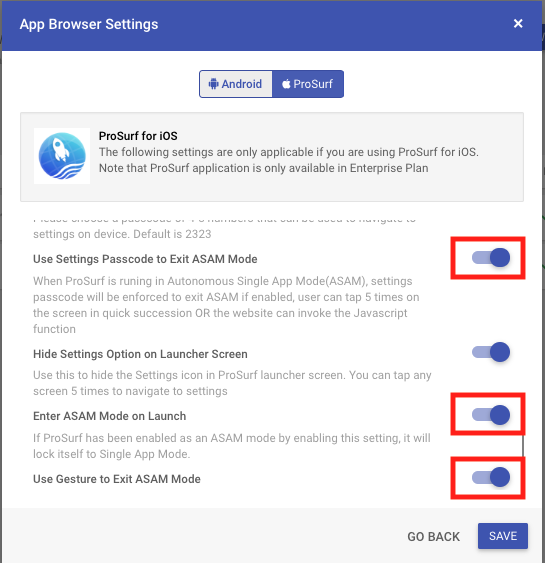 Enter ASAM Mode on Launch: Enable this setting so that whenever user launches the ProSurf application, it will be locked into ASAM mode. Use Gesture to Exit ASAM Mode: Enable this so that the user can tap 5 times quickly on the screen to see the Exit ASAM option. Use Settings Passcode to Exit ASAM Mode: This is an optional setting. 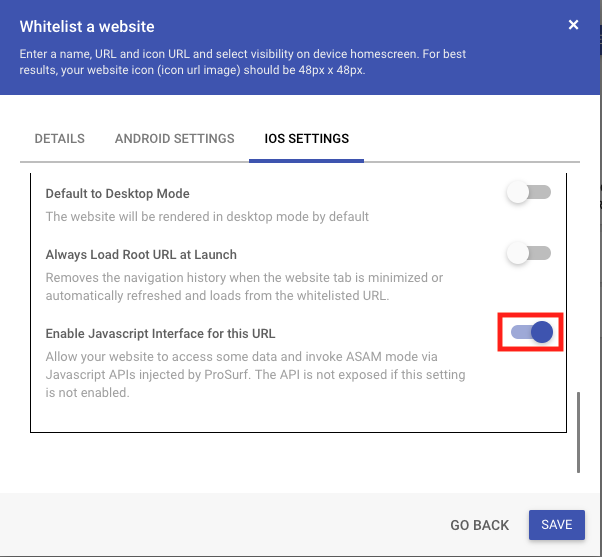 Use this if you want to enforce the user's to enter the settings passcode that you have set on Dashboard to exit ASAM mode. Once these settings are applied on device, then whenever user launches the ProSurf application then it will lock itself into single app mode. User can tap 5 times in quick succession and they will see an option to exit out of single app mode. Please feel free to contact our support if you are having issues in implementing this feature or want to get more details about this feature.